Sen. Lindsey Graham also said U.S. farmers are "on the front lines." Republican Sen. Lindsey Graham said President Donald Trump is doing the right thing in placing tariffs on Chinese imports, although he said some U.S. businesses may suffer "in the short term." “There is no way for us to address China without absorbing some pain here,” the South Carolina senator told ABC News Chief Global Affairs Correspondent and “This Week” co-anchor Martha Raddatz. Trump and China's government escalated their trade clash Friday, with Beijing vowing to "counterattack with great strength" if Trump follows through on threats to impose tariffs on an additional $100 billion in Chinese goods. Trump made his move when China threatened to retaliate for the first round of tariffs planned by the United States. The stock market fell more than 500 points Friday on worries over a trade war. Graham on "This Week" acknowledged that U.S. farmers and some industries may be hurt by a trade conflict with the giant Asian country. But he predicted that the U.S. may prevail because the Chinese need American goods more than the other way around. "Our farming community is on the front lines, but we’ve got to stick with it," the senator said. "The Chinese need us more than we need them economically, and the only way you’ll get China to change is make them pay a price." The Chinese are big consumers of U.S. soybeans and pork, Graham said: "They’ve got 1.2 billion people to feed." "If you put tariffs on pork products coming in from the United States, the pork prices go up in China," he said. "Or you turn to some other country to get your pork. There’s eventually going to be a problem in China. When you increase tariffs on soybeans, commodity prices go up in China." (J. Scott Applewhite/AP) Sen. Lindsey Graham speaks to reporters on Capitol Hill in Washington, Jan. 25, 2018. 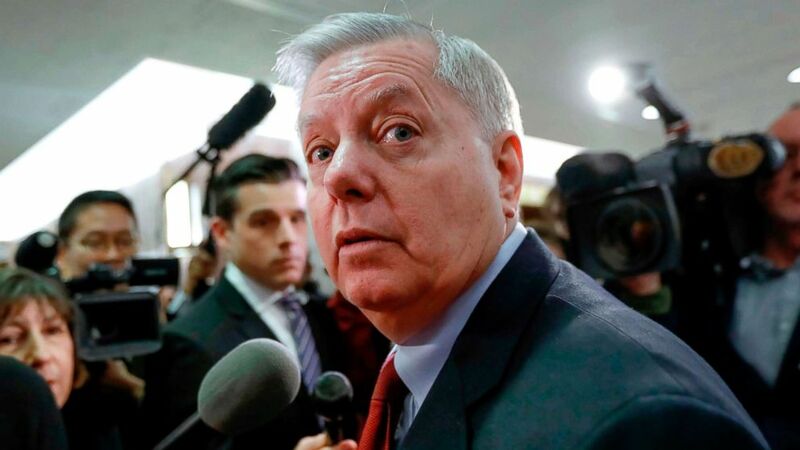 Public pressure in China could sway government trade policy, Graham suggested: "The Chinese people don’t get to vote, but they do get to grumble." Graham acknowledged that the trade conflict could hurt a company in his state, BMW. South Carolina is home to the only U.S. manufacturer of BMW cars, whose chief executive said last month that steel and aluminum import tariffs imposed by Trump could hurt his company. The South Carolina senator said Sunday, "It will hurt BMW in the short term to deal with the Chinese steel dumping, I understand that." (J.B. Forbes/St. 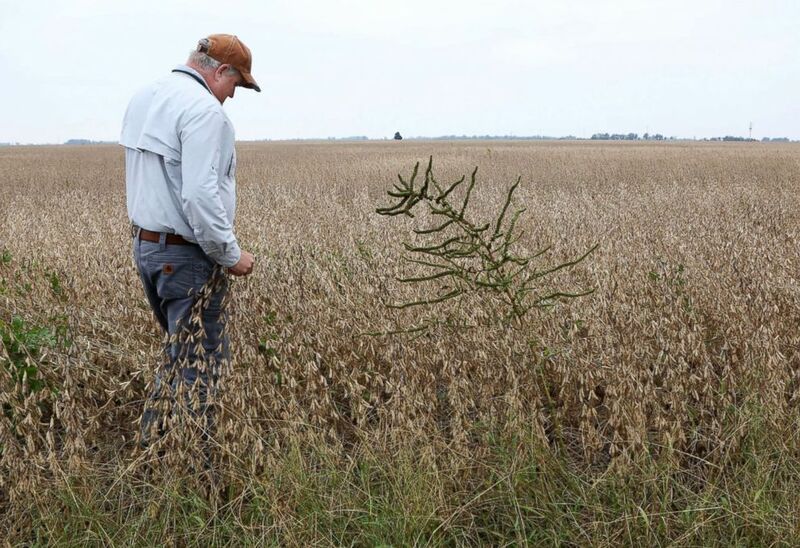 Louis Post-Dispatch/TNS via Getty Images, FILE) Farmer Jason Bean stands next to a pig weed plant at the edge of his soy bean field, Oct. 12, 2017, at his farm near Peach Orchard, Mo. Bean is busy harvesting his soybeans, rice, and cotton this month. "But at the end of the day, the president promised if he got to be president he would push back against China," Graham added. "That’s exactly what he’s doing. They’re pushing back against us. I like our chances of prevailing if we stick with it." The dispute began in March when Trump announced a 25 percent tariff on steel and aluminum imports from all countries except Canada and Mexico. Then, in an effort to punish China over its alleged theft of intellectual property, Trump on Tuesday proposed a 25 percent tariff on $50 billion of imported Chinese goods. China retaliated the next day with a proposed 25 percent tariff of its own. Trump responded by directing U.S. trade representatives to consider an additional tariff on $100 billion of Chinese goods. (J.B. Forbes/St. 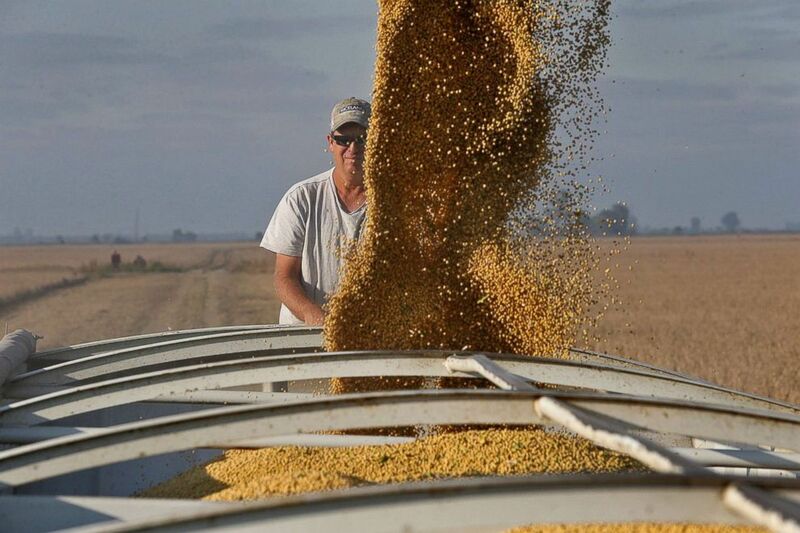 Louis Post-Dispatch/TNS via Getty Images, FILE) Farmer Chris Crosskno watches as soy beans are loaded into his truck, Oct. 11, 2017, at his farm near Denton, Mo.